Singapore’s first and longest serving Prime Minister Lee Kuan Yew was regarded as one the most influential political figures in Asia. He died early Monday at age 91 from pneumonia. 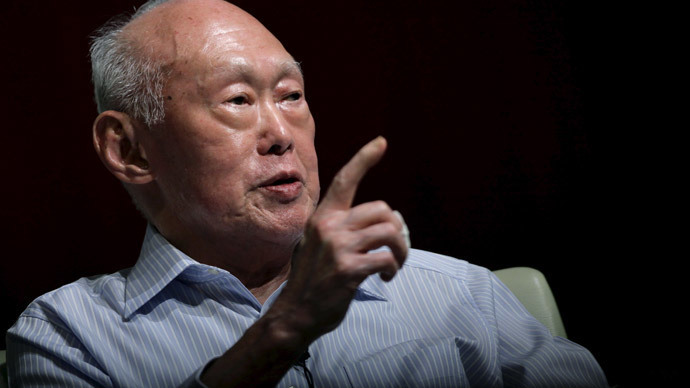 “The Prime Minister is deeply grieved to announce the passing of Mr. Lee Kuan Yew, the founding Prime Minister of Singapore,” said a statement on the Singapore prime minister’s website on Monday. With an average per capita GDP of just $427.9 in 1960, Singapore surged more than a hundred times to over $55,000 in 2013, making the country one of the richest. Singapore has overtaken Hong Kong and Japan, as well as established European economies such as the UK. Prime Minister Lee Kuan Yew’s policy was aimed at encouraging savings and investment, keeping inflation and taxes low and currencies stable, and emphasizing high-quality education. Lee pushed the island to develop key infrastructure, he focused on housing and jobs. “I am often accused of interfering in the private lives of citizens. Yes, if I did not, had I not done that, we wouldn’t be here today,” he said in 1987. Lee Kuan Yew came to power in 1959 and led Singapore to independence from Malaysia in 1965. A tiny land with no natural resources turned into a global economic powerhouse under his guidance. "I was trying to create, in a third world situation, a first world oasis,” Lee said in an interview in 2008. The economy of modern Singapore is known as one of the freest, most innovative and business-friendly, according to the Asian Century Institute. It was ranked the second freest economy in the 2011 Index of Economic Freedom behind Hong Kong. The Global Competitiveness Index 2012-2013 ranks Singapore as the most competitive country in world. Prime Minister Lee underlined the role of government rather than the free hand of the market. Singapore today attracts a large amount of foreign investment as a result of its corruption-free environment, low tax rates and advanced infrastructure. Foreign direct investment in the country amounted to $534 billion in 2011; according to the 2014 Investment Climate report from Singapore’s government. Singapore has a 7 percent corporate tax and 0-20 percent personal tax rate. More than 7,000 multinational corporations from the United States, Japan, and Europe are located in the country. However, Lee was criticized for his iron-fisted rule, which forced several opposition politicians into bankruptcy or exile. "Between being loved and being feared, I have always believed Machiavelli was right. If nobody is afraid of me, I'm meaningless." Lee Kuan Yew stepped down as Prime Minister in 1990; nevertheless he remained “minister mentor” till 2011 when his eldest son Lee Hsien Loong was elected for a second term as prime minister.